Come join us as we stroll the galleries in Laguna Beach, which will be welcoming us with snacks and beverages. 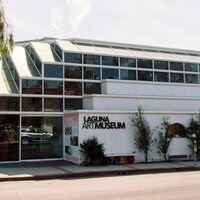 Meet at the Laguna Beach Art Museum. Trolleys will drop us off around town and we may stop for a bite to eat or a gelato. Note that the trolleys do not service the free parking lots on Laguna Canyon Road. Self-drive to the Laguna Art Museum. Park wherever you can (paid lots or side streets). Meet near the entrance to the museum by 5:45 PM.